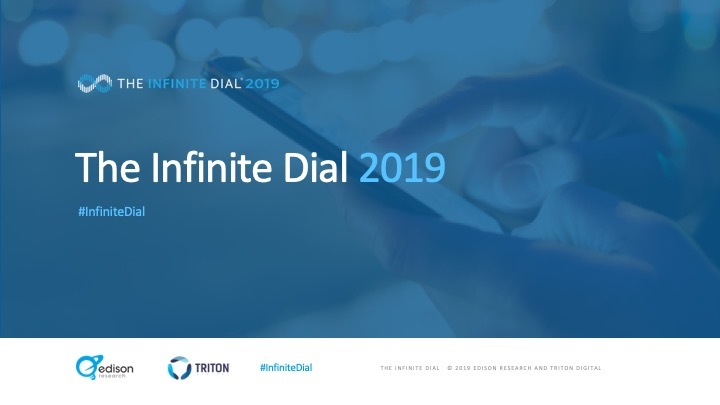 Please save the date for the 2019 Edison Research/Triton Digital Infinite Dial webinar, which will take place on Wednesday, March 6th, at 2 PM Eastern. We will be streaming the results live online, and the complete presentation will be available at edisonresearch.com and tritondigital.com subsequent to the webinar. The Infinite Dial remains the longest-running study of consumer behaviors around media and technology in America. This year, we will continue to measure a number of trends in media usage and consumption habits, particularly about streaming media, radio, mobile media consumption, and social media behaviors, and we have expanded our podcasting and smart speaker sections. Attendees will learn how the streaming audio landscape has changed, which social media platforms are growing, and how smart speaker ownership is trending. The webinar will be hosted by Tom Webster, Senior Vice President, Edison Research and John Rosso, President, Market Development of Triton Digital. Click to register and view the Infinite Dial 2019! Thirteen years ago, when the only ways to listen to a podcast were through a computer or by transferring it to an iPod, someone from Edison Research added a question about podcast listening to our annual study Infinite Dial study. Thanks to the foresight of that hero of an audio geek, Edison has a unique look at the history of the growth of podcast listening in the U.S.
And throughout that history, we have observed that the number of women podcast listeners has trailed behind the number of men listeners. In the earlier years of podcasting, the gap was significant (in 2008, the percent of women who ever listened to a podcast lagged behind men by 25%). Today, podcasters are inching toward closing that gender listening gap (in 2018, the percent of women who ever listen to podcasts only lags behind men by 9%), and we at Edison would like to provide some information that might help close the gap further. To do so, we’ll look at some of our previously published studies to take a closer look at the women in those data sets to understand podcasting’s role in women’s lives. The 2018 Infinite Dial® Study from Edison Research® and Triton Digital® covers the latest research in digital audio, social media, mobile, smart speakers, and podcast consumption. 2018 was, amazingly, the 20th anniversary of the Infinite Dial, making it the longest-running survey of digital media consumer behavior in America. According to Infinite Dial, in 2018 just over one quarter (26%) of the 12+ U.S. population are monthly listeners. The Infinite Dial estimates show that men’s monthly podcast listening was flat from 2017 to 2018. While women are still behind men in monthly podcast listening, they did grow from 21% in 2017 to 24% in 2018 – which makes for an estimated 34 million women listening. Women monthly podcast consumers overall are younger than the 12+ population, with 44% of them under the age of 35 compared to 37% in the total population. Women age 25-34 are the really sweet spot for podcasting listenership, with over a third of them saying they’ve listened to a podcast in the last month. There is still a lot of room for growth among in the other age groups, especially with women age 55 and older, with only 13% saying they’ve listened to a podcast in the last month. Compared to the total population, age 18+, women podcast consumers have a higher annual household income. Fully 44% have a household income of $75,000, compared to only 38% of the total population. Women podcast consumers are also more likely to have obtained higher education than compared to the total population. Thirty-six percent of women who are monthly podcast consumers have attended at least some graduate school (vs. 23% of all Americans). So, women podcast listeners are pretty well-off and highly educated: two very sought after demographics for advertisers. One number that we really see grow year after year is the amount of time these weekly listeners spend listening to podcasts. In 2018, women podcast consumers that reported listening in the last week (15% of U.S. women), listen to an average of 5 hours and 37 minutes of podcasts per week, which is up from 4 hours and 29 minutes in 2017. Women weekly podcast consumers listen to an average of seven podcasts per week, up from five per week in 2017. These data along with and in-person interviews with podcast listeners all indicate that when someone becomes a podcast listener, he/she spends a lot of time listening to podcasts. Edison Research’s Share of Ear® study looks more deeply at time spent listening. Edison Research’s Share of Ear® quantifies the reach and time spent with of all forms of audio. It is the only single-source measurement that puts broadcast radio, Internet-only streaming audio, podcasting, satellite radio, TV music channels, and listeners’ own music collections together. More information about the study is available here. Americans age 13+ spend an average of four hours per day listening to audio. When you break out those four hours, we see 46% of that time goes to AM/FM Radio listening, 14% to streaming audio, 12% owned music, and 3% to podcasts. But, what’s really powerful is when you look at the Share of Ear among women podcast listeners. 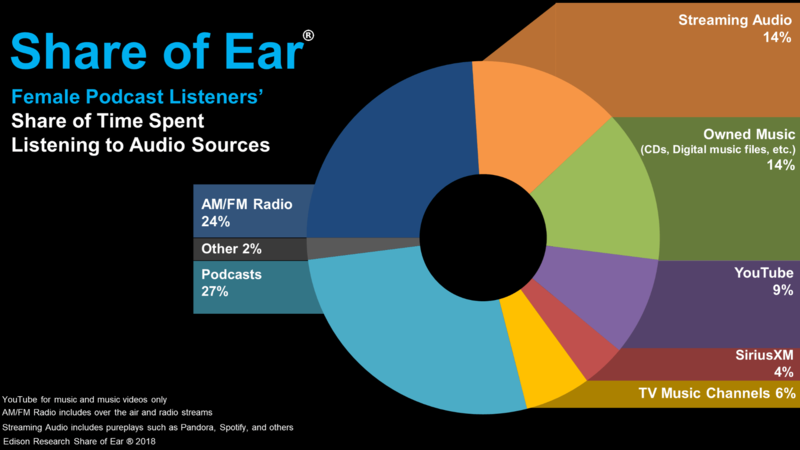 As seen below, a whopping 27% of their listening goes to podcasting and AM/FM Radio listening drops to 24% of their time. So, when women start listening to podcasts, the majority of their overall listening time is dedicated to podcasts. But how do you convert non-podcast listeners into podcast listeners? While the Infinite Dial provides a lot of information about podcast listeners, and Share of Ear gives us an idea of how much women podcast listeners listen, we wanted to know more about those women who do not listen to podcasts. So, we conducted a separate survey with those who are familiar with the term podcasting, but are not listeners. That data has been previously released as part of Tom Webster’s “Podcasting’s Next Frontier: A Manifesto for Growth,” but we’ll, again, look at this data by women to better understand the roadblocks podcasters face in picking up never-before listeners. There is also a lack of a clear understanding about the technology needed to listen to a podcast. Thirty-eight percent of our women respondents said they “aren’t sure how to listen to podcasts” and 66% said they “don’t know where to start.” We have heard these sentiments repeated in multiple in-person interviews and focus groups with non-podcast listeners. In our interviews, women were overwhelmed by the number of choices. They need someone to curate and recommend to them what content they might like. Three-quarters of women who do not listen said they don’t have a podcast app. We know that, indeed, most DO have a podcast app (at minimum Spotify or Pandora); they are just are unaware. Pretty much all podcast listeners know that one can download and play a podcast later, but that information hasn’t been passed down to non-listeners: Sixty-eight percent of women familiar with the term “podcasts” but who do no listen thought that podcasts would use up their data plans. Sixty-one percent said they would listen if there were topics they were interested in, and this could be a case where they are not familiar with the content that’s out there for them, or perhaps podcasters can do more to create content that appeals to women. Sixty-percent of women familiar with podcast but don’t listen say “podcasts just aren’t for me.” Perhaps many of them are “music-only” people. We know from Share of Ear that not everyone likes speech-based audio. However, hearing such a large percentage of women saying “it’s just not for me” could just indicate that the podcasting industry has not done a good enough job in explaining what’s available to potential listeners. So what will we see in 2019? Will we see that podcasting has finally closed the gap between men and women listeners when Edison Research and Triton Digital released the Infinite Dial in 2019? Will we see more women-focused podcasts and women-produced podcasts? Will there be more shows universally liked across all demos that are so appealing to non-listeners that they overcome some of the obstacles that have kept them from listening previously? We are not in the business of predicting the future at Edison, but we do have some recommendations to help close the gender listening gap. Second, get to know your listeners. How much do you know about your listeners? There are so many ways to learn and interact with them. Certainly knowing basic demographics will help you sell sponsorships. But, there are other ways to learn about them too. Listen to your listeners. Invite them to email their thoughts or send audio files or interact with them on social media. Build time into your day EVERYDAY to listen to your audience. If you understand your audience, you’ll learn how to better serve them, which in the end, will better serve you too. Lastly, invite listeners into your club. You are more than a podcast. You are a club, a community, a group of like-minded people looking to connect. Have you ever met a stranger and somehow found out that you like the same podcast? Did you instantly feel like friends? It’s an amazing phenomenon. 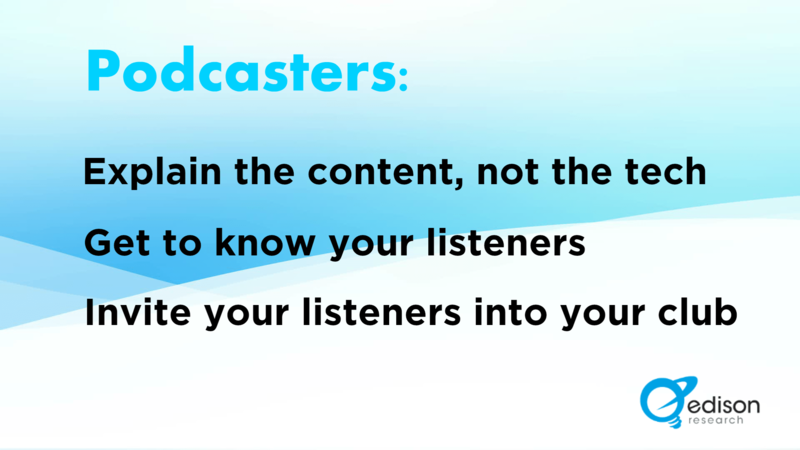 You need to think about your podcast as just touchpoint for your entire community of listeners. Everyone wants to feel like they are a part of something. Allow people to be a part of your club. Ask them to do something more meaningful than rate your show or write a review. Maybe ask them to contribute ideas or perhaps there is a cause that is important to you and your listeners that you can support together. Be more than just a podcast by inviting others to join you in doing something. And if you can’t tell what your something is, then maybe you should work on that. Because the best shows out there are more than just shows. Recently, my colleagues Melissa Kiesche and Megan Lazovick gave a presentation at WerkIt – A Woman’s Podcast Festival. Their presentation, Closing the Listening Gender Gap, presented some new data on the composition of the podcasting audience and also some of the reasons why some women don’t listen to podcasts. 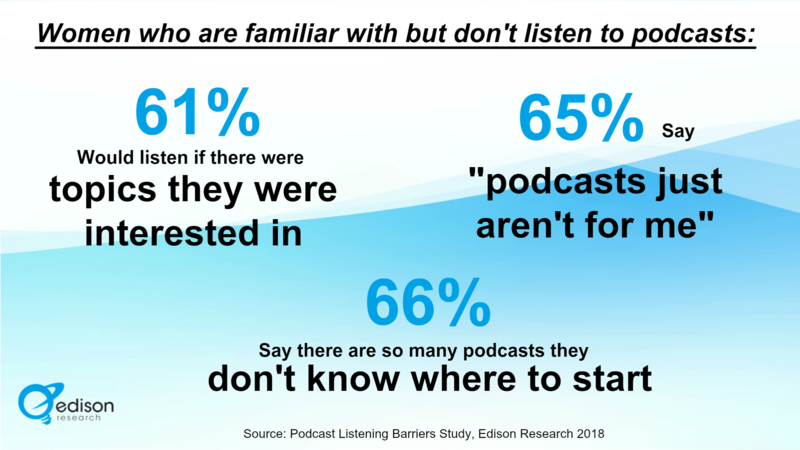 You can download the full presentation here–it’s terrific–but it reminded us here at Edison that it’s a good time to revisit another aspect of this evolving medium: the growing diversity of podcast listeners. Here’s what is notable about the comparison of these two pie charts: absolutely nothing. And that’s wonderful news for the medium–the podcast audience today looks nearly identical to the population in general, and that means podcast producers have a wonderful opportunity to create an equally diverse portfolio of content. With the podcast audience essentially mirroring America, podcasters truly have an entrée into winning over The 52–the 52 million Americans who have heard of podcasting, but haven’t yet taken the podcast plunge. Just one short decade ago, the podcast audience was nearly three-quarters White, which was as much a reflection of the types of content being produced at that time as any other explanation. But over the last 10 years, podcasters themselves have become more diverse, and with that so has the universe of available content. A lot has changed in just 10 years. Just think–back in 2008, we didn’t have Spotify, Snapchat, Uber, GPS on your phone, or Ed Sheeran. But for the ethnic diversity of podcast listeners to change so much over the last ten years is a tribute to the great democracy of podcasting: anyone with a story to tell, can tell that story. Increasingly, America–and the world–is listening.